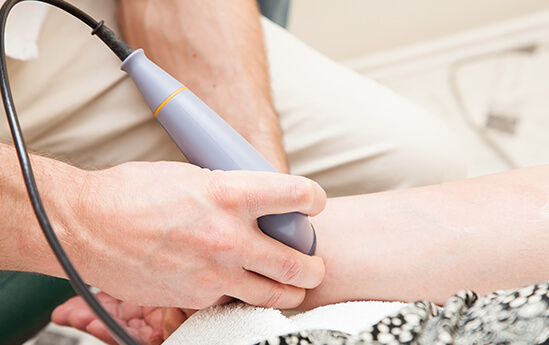 Ultrasound therapy is used by physical therapist to treat a range of injuries for their patients such as, muscle and tendon injuries that is causing pain and discomfort. When the typical over-the-counter pain relief medications are not effective or cannot be taken be a patient for whatever reason such as an allergy, the patient can consider other more therapeutic options like ultrasound therapy. The basics of ultrasound therapy is using different intensities and frequencies of sound to stimulate the injured area. Kind of like a vibration type of therapy. The technique has been used since early 1940’s and has since been proven a very effective method to increase in local blood flow to the injured area which helps to reduce local swelling and chronic inflammation. According to some studies ultrasound therapy has also been known to promote the healing of a bone fracture. The more forward benefit to this treatment option is that it doesn’t involve having to take more medications and it is a more non-invasive, natural approach to healing. It’s the ideal approach for patients who are not comfortable with injections or have allergies to certain medications. It only takes about 3-5 minutes depending on the area being treated. You feel no pain or discomfort from the treatment itself. The ultrasound is applied just like how a pregnant women would receive an ultrasound around the abdomen except the round headed wand or probe would be applied to the injured area, directly onto the patient’s skin such as the knee or shoulder. A gel is applied to the skin first to allow the wand to move smoothly and without friction. During the ultrasound therapy session, the wand will be moving constantly. The sound waves that are transmitted through the skin will cause a vibration of the local tissues. Again, patients won’t normally feel any pain unless there is a minor break in a bone close to the surface, In this case a patient might feel a sharp pain. What happens is the sound waves could become trapped between two parts of the break which will translate to a sharp pain however, this can be result in an accurate way of diagnosing a fracture. An injury to the neck caused when the neck is jerked in a back-and-forth motion, following a rapid acceleration or deceleration of force. Symptoms usually appear within 24 hours of the incident and can include, headaches, neck pain, back pain, jaw pain, fatigue, dizziness, and nausea. A condition in which the fibrous disks that work to absorb the shock between the spine’s vertebrae bones lose their moisture content as someone ages naturally, becoming more brittle and shrink in size. The discs begin to feel less sponge-like which can cause inflammation or put direct pressure on the spinal nerve. The process of disk degeneration may be accelerated by trauma from a sports injury, lifting, and other physical activities. It can occur in any part along the spine, but is most often occurs in the neck and back. Osteoarthritis is the most common form of arthritis. It occurs when the protective cartilage on the ends of your bones wears down over time. It can occur with any joint in your body however, the disorder most commonly affects joints in your hands, knees, hips and spine. Osteoarthritis symptoms can usually be effectively managed, although the underlying process cannot be reversed. Adopting healthy eating habits, staying active and other helpful treatments, may slow down the development of the disease and help alleviate pain and improve joint function.